This recipe was given to me by my friend’s mom. One of the best eggplant recipes I have ever had. I think she took this recipe from a Vegetarian magazine, just not sure what issue. It takes a little bit of preparation to make but it is worth all the effort. You will not be disappointed. Peel and slice the eggplant in ½” slices. Sprinkle salt on each slice and pile the cut eggplant into a colander for 30 minutes. This will draw the excess water out of the eggplant and prevents the dish from becoming watery. Rinse and pat dry the sliced eggplant with paper towels. 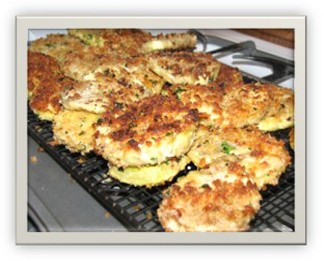 Combine the bread crumbs, ¼ of the Parmesan cheese and parsley. Melt the 2 teaspoons of butter and 2 tablespoons of the olive oil in a large skillet over medium heat. Dip each eggplant into the egg mixture and then the breadcrumb / cheese mixture and fill the skillet without any overlapping. Fry each side until slightly brown. Repeat the process with butter and oil until all the eggplant slices are browned. 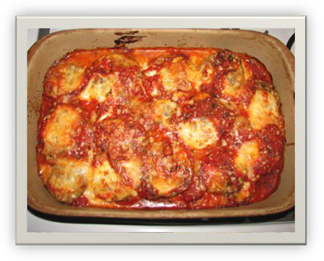 Spread ¼ cup of the marinara sauce on the bottom of 9 x 13 stoneware or baking dish. Place one layer of eggplant slices on the sauce. Cover with half of the fresh mozzarella cheese slices. Spoon 1 cup of the marinara sauce over all the cheese. Sprinkle with half the Parmesan cheese and repeat the layers ending with the Parmesan cheese. You can adjust the cheese amounts to your taste buds. I know that I added more Parmesan cheese to this recipe because I like the extra cheese and flavor. Bake at 350 degrees for 25 to 30 minutes until bubbly. Let stand 10 minutes before serving. Enjoy! You can put extra slices of eggplant on wax paper lined cookie tray and freeze overnight. Then put in plastic freezer bags for storage and save for a rainy day to make this recipe again). The nutrition in eggplant includes potassium, manganese, copper, magnesium, and several B-Complex vitamins. I was experimenting with a lot of recipes involving mushrooms. 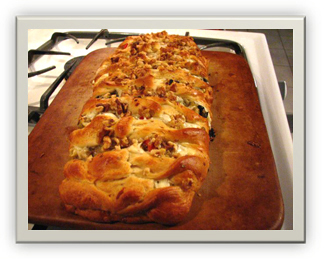 I added the eggplant as a wow factor and believe me this recipe is a wow factor!